Our business slogan, "We bring our doorstep to you" explains not only our unusual name, Doorstep D.O.T. Medical Certification, but also our unique approach to providing Occupational Medicine services right where you are. Our "medical clinic" is a beautifully renovated 33' Winnebago RV with a reception desk, waiting area, restroom, laboratory and examination room! We are ready to serve you in a local shopping center, at your place of employment, at a gas station or rest stop or anywhere else you see our "clinic" out and about in your neighborhood. This is the most convenient alternative ever offered with which to provide the required medical examination for the millions of professional drivers and others who depend on DOT medical certification to keep them safely and legally on the road. Our medical clinic says, "Right Here, Right Now" on the side of it! 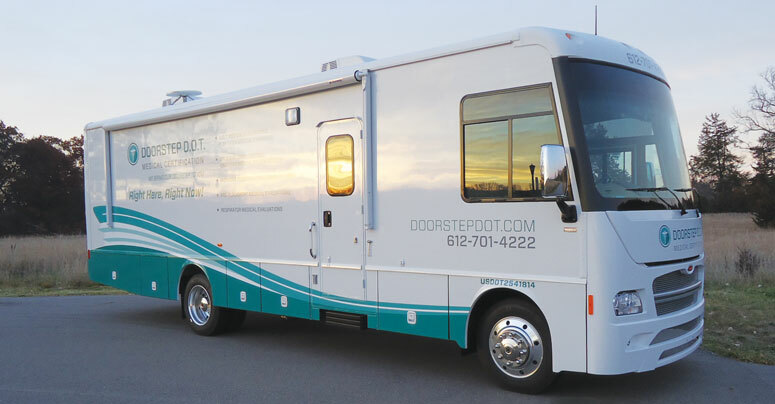 So if you are in need of a new or updated medical certificate and see our big green and white RV, take us up on our offer and call 612-701-4222.